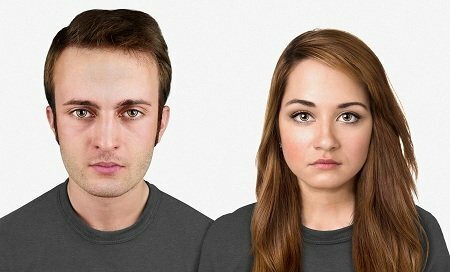 While the future remains unknowable (for now), Nickolay Lamm produced one set of possible changes to the human face in one possible timeline where, 100,000 years in the future, through zygotic genome engineering technology, our future selves control human biology and human evolution the way we control electrons today. In this future, humankind has wrested control of the human form from natural evolution and are able to bend human biology to human needs. This future scenario and these figures are envisioned by Dr. Alan Kwan, PhD Computational Genomics from Washington University. What we look like today. What we look like in 20,000 years. As our understanding of the universe increases, we predict that the human head will trend larger to accommodate a larger brain. But instead of some orthogonal evolutionary path that ends up with the 210th century human a la Futurama’s Morbo the anchor-alien, the rule of viable human biology will still apply and so the entire head will trend larger, though with a bias for a greater cranium growth than facial growth; the human 20,000 years from now would look to us like someone today except we would notice the forehead is subtly too large. By this point, communications lenses will have replaced devices such as Google Glass. 1. 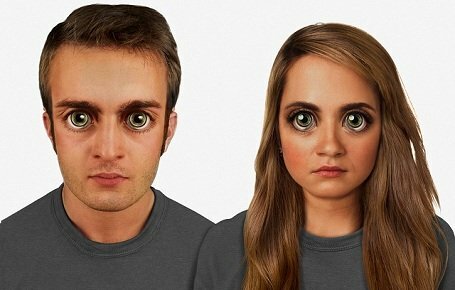 Larger eyes in response to the dimmer environment of colonies further from the Sun than Earth. 2. More pigmented skin to alleviate the damaging impact of much more harmful UV radiation outside of the Earth’s protective ozone. 3. Thicker eyelids or a more pronounced superciliary arch to alleviate the effects low or no gravity that disrupt and disorient the eyesight of today’s astronauts on the ISS. By this point in time, communications lenses (commlens) in contacts and miniature bone-conduction devices implanted above the ear will work in tandem. Bone-conduction devices, with embedded nanochips, will communicate with some external device for communications and entertainment. 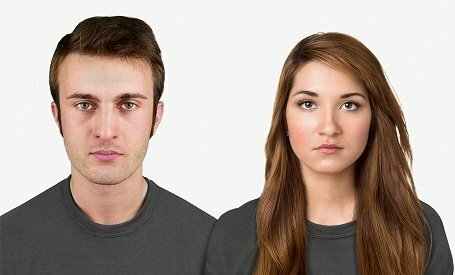 This human face will be heavily biased towards features that humans find fundamentally appealing: strong, regal lines, straight nose, intense eyes, and placement of facial features that adhere to the golden ratio and left/right perfect symmetry. Functional bias will be incorporated into the vanity driven constraints above. Eyes would seem unnervingly large to us and have “eye shine” from the tapetum lucidum. Sideways blink of the reintroduced plica semilunaris to further protect from cosmic ray effects would be particularly startling.